I just returned the last week of September from an annual conference that several THSC staff members and I attend with the National Alliance of Christian Home Education Leadership. This conference is conducted by an organization made up of state home school leaders and is, essentially, an association of state home school organizations. We get together each year for a few days and share what we all do and how we do it. It’s a great opportunity for us at THSC to share what we do in Texas and to learn from other groups. One of the struggles I have at this meeting is that many of these groups and leaders look at Texas and think that we have things so good because, well, it’s Texas! I try to share that our freedom is the result of God’s grace and the hard work of home schoolers back in the 1980s and that we work hard to protect and expand our freedom. Supervision by a licensed Iowa teacher. While it is tempting to talk about how this victory actually happened and to give a blow-by-blow, that is not where the story starts. The president of the state home school organization in Iowa told me that they had filed legislation to eliminate the restrictions on home schooling every year for the last 11 years! The Iowa Legislature meets every year, and for more than a decade the state home school organization filed legislation to free home schoolers. Sometimes they met with partial success, but then the governor would veto their bills. Yet, they continued to persevere. In addition to repeatedly filing legislation, Iowa home school leaders spoke at meetings about the need for home schoolers to run for the state legislature. In fact, over the last 11 years they were successful in recruiting and helping elect 10 state House members who were also home school parents! Iowa has a Republican governor, a state House controlled by Republicans, and a state Senate controlled by Democrats. A Republican member of the state House, who is also a home school dad, attached an amendment to an education reform bill that would give home schoolers in Iowa freedom and even allow them to teach their children to drive. Such a move even surprised the home school leaders in Iowa. While the governor supported the measure, the teacher unions did not. This Republican legislator said, “At the end of the day, this is about liberty, this is about freedom, this is about me being able to raise my children in the way that I see fit without having to get a sanction from the government upon these studies that the government thinks my children should learn.” Kind of sounds like a Texan doesn’t he? The Democratic legislators wanted the education reform bill because it contained a serious raise for public school teachers. They did not want the home school liberty language, but every member of the House voted for it. The Democrats’ plan, however, was simple: they would remove the home school language during negotiations between the Senate and the House. There was one problem with that plan. A block of Republican home school legislators would not accept it. They made it very clear that the only reason they supported the bill was the home school freedom language and that they were willing to kill the bill if that language was removed. Consequently, the teacher unions decided they could live with the language, and home schoolers in Iowa gained their freedom. So what is the lesson we can take away from this story? Home school leaders refused to give up on their quest for freedom and they gained it. THSC will be back at the Texas Legislature next session to continue to seek passage of the Texas Parental Rights Restoration Act to protect parents, and we will continue to push for the passage of UIL participation for home schoolers as well. As in Iowa, Texas home schoolers are seen as a very active voting constituency, and we must become as actively involved in the campaigns of candidates for the Texas Legislature as we have been in the legislative session. While candidates are running for office is the time to educate them on issues of importance to the home school community and to get their commitments to support these issues. I encourage home school parents to consider running for the Texas Legislature and to contact THSC for information about doing so. Now is also the time to work for candidates who support home schooling and parental rights and against legislators who oppose such measures. This is the way the process works in Texas: In odd-numbered years the Texas Legislature meets, and THSC works hard to protect our freedom and expand it. In even-numbered years we participate in elections to educate candidates on our issues and to elect as many as we can who will stand with us when the time comes. As our friends in Iowa have so clearly demonstrated, freedom is not easily gained. It is often earned over many years of hard work and dedicated effort. We must never give up in the battle to protect and expand our freedom. I hope you will stand with us in this ongoing effort. That is wonderful about Iowa! I’m very grateful for the liberty that we have to freely educate our children i this great state and therefore I am very thankful for your hard work in interceding for us. God bless you. Thank you for all that you do. 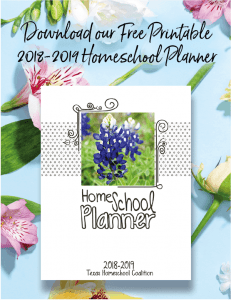 We are blessed to live in Texas, and thankful for our homeschool pioneers! Great article, Tim! You are doing a great job keeping freedom alive in Texas! I am amazed at the brazen manner in which progressive socialists and athiests attempt to cut God out of our culture. Freedom-loving men and women must continue to be uncomfortable with efforts by big government proponents to encroach on parental rights to train their children. Thanks for your selfless efforts to defend freedom and oppose evil. Thank you for writing this report. I dream of having something similar to happen in Pennsylvania that will eliminate some of the unnecessary burden imposed on us. It will take dedication to hard work and I pray that God will raise up others who share the frustration if not the devotion to freedom.